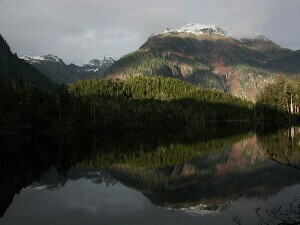 Beaver Lake is a medium sized lake surrounded by old growth forest and bogs sitting at an elevation of 440 feet on a lower bench of Bear Mountain. The trail is accessed from the Blue Lake Campground. For those that can make it up the first section of switchbacks that go up the steep hillside, it provides a nice hike with the possibility of some spectacular views of the nearby mountains. Year-round hiking of this trail is possible, but public access along Blue Lake road is limited to foot and bicycle traffic during the winter months. At times the road may be impassable or dangerous even to foot traffic due to avalanches (especially in late winter and early spring). The trail may be quite icy during the winter. The first quarter mile consists of a series of switchbacks up a steep hillside from the bottom of the valley with an elevation gain of more 200 feet. After the first quarter mile the elevation change to the lake is slight. There are a few short hills along the loop with the largest of them gaining (and dropping) about 60 feet as the trail goes over a small muskeg covered hill. The loop trail was completed in Spring 2004 with the rest of the trail receiving significant maintenance as part of the work. In winter sections of the trail may be quite icy. Sawmill Creek Boulevard to Blue Lake Road. The loop trail passes through sections of oldgrowth as well as bogs and fens (muskeg). These combined with the riparian habitats of the outlet stream and the other semi-aquatic habitats of the lake shore provide an opportunity to observe a wide variety of different organisms. Beaver Lake has been stocked with grayling which can be fished for in the lake.